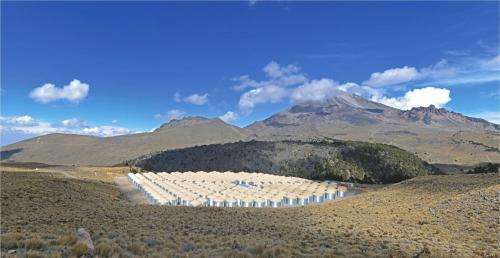 The High Altitude Water Cherenkov (HAWC) Gamma-Ray Observatory, located at 4000 m above sea level on the slopes of Mexico’s Volcán Sierra Negra, is the newest tool available to visualize the most energetic phenomena in the Universe, such as supernovae, neutron star collisions and active galactic nuclei. In March 2015, construction was completed on HAWC’s 300th and final detector tank (each holding 200,000 liters of water), and the observatory will soon begin collecting data at full capacity. It is a joint project between U.S. and Mexican scientists, with some participation from Polish and Costa Rican scientists. Links: Phys.org article; HAWC Observatory home.